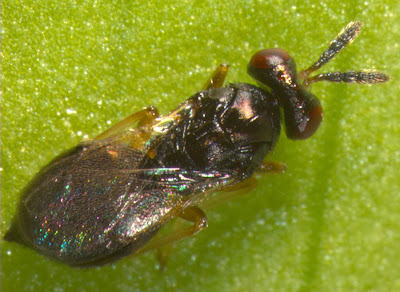 Tetrastichus is a cosmopolitan genus of parasitic wasps, with known hosts including Coleoptera, Lepidoptera and phytophagous Hymenoptera (Bouček 1988). Characters (from Bouček 1988): Clypeal margin bilobed; scutellum with two pairs of setae, anterior pair removed from front border; submarginal vein with one or 2 dorsal bristles only; propodeum mesad of spiracle with an inverted V-shaped carina, i.e. with plica which behind middle sends off a branch towards the postero-lateral corner, propodeum medially never very short, usually reticulate.